Puri Saren Ubud (Ubud Palace) is an Ubud Kingdom Palace with beautiful Balinese traditional houses as a residence of Ubud King. It is set in the center of Ubud Bali with traditional art market just in front of it and it is found by Ida Tjokorda Putu Kandel who has commanded from year 1800 - 1823. This palace is an artistic cultural life center, while the traditional market is the symbol of local economics resident. The existence of Puri Saren as a palace is equipped by a Wantilan/auditorium that is a large building of meeting room and a banyan tree as shelter place at the daytime. The traditional market is the place of society economics and its existence is always border on palace as artistic cultural life center. It means that the both pole meeting is describing the dynamics of society and kingdom life. The palace is very beautiful with artistically traditional building and contains the high esthetics value. It is situated in the good temperature which can give the ruthless and freshness for every visitor. Some world class painters from Europe have lived in Ubud like Rudolf Bonnet, Walter Spies, Arie Smith, Antonio Blanko, Hans Snell and others. Puri saren palace is added in Bali itinerary 2 days and Bali itinerary 5 days. 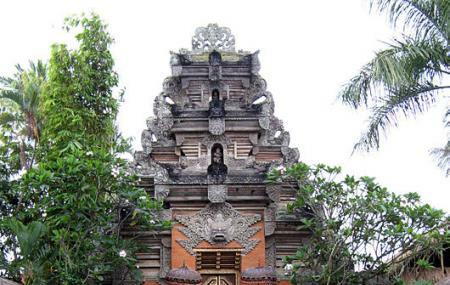 Use Bali trip planner to know how to reach Puri Saren Palace. Do not miss the Balinese dance performance. If you wish to watch the dance performance you need to be a little early to grab a proper seat. Balinese dance performance starts at 7:30pm. By rented Car or Motorbike. How popular is Puri Saren Palace? People normally club together Monkey Forest and Lotus Lagoon while planning their visit to Puri Saren Palace.